← #LCSM Chat Topic 5/4 — The PDQ on MTBs: Why are multidisciplinary tumor boards important in #lungcancer? This entry was posted in Lung Cancer, Patient Advocacy, Patient-Driven Research, The Bright Side, What Matters Most and tagged find the meaning, Finding a purpose. Bookmark the permalink. An awesome post! Thank you. Thank you, Celia! Your blog is a good example of purpose. You have handled that diagnosis from 6 years ago in the most amazing, exemplary way, Janet. You are a true survivor, providing inspiration, hope and knowledge wherever you go. Thank you, Judy. I’ve appreciated your support over the years. Janet, Congratulations on your 6 year cancerversary and living life to the fullest of your abillities. You are a force to be reckoned with!!! Thank you for your untiring efforts to benefit us all. I follow your emails, but have not replies previously, but you have been an inspiration to me for several years. Here’s a toast to you being an overcomer “clink”. This month will be my 7 year cancerversary and it certainly has not always been easy, but I am still living this life and not done yet! Best hopes for us all. Thank you, Sharon! Congrats on your seven year cancerversary! Best hopes for many more years for you as well. Thank you Carrie. I’ve enjoyed working with you! Thank you for everything you do for us, and thank you for your description of your evolution into an activist. We could use so many more like you. May you be NED forever! I’m curious about your medication ritutals and side effects. Can you expand? Also, if you’re NED, what are you being treated for? I didn’t go into detail about my treatment in this post because that’s explained elsewhere on my site. I’m NED thanks to an oral cancer drug (a targeted therapy called crizotinib) that inhibits my type of cancer (ROS1 positive NSCLC). I’ve been on crizotinib since November 2012; it does not cure, and most all patients who take it eventually experience cancer progression. I take medications that help me cope with the side effects of crizotinib, a blood thinner (I developed a blood clot in my pulmonary artery a couple of years ago–blood clots are common in cancer patients), and a drug for gastric reflux (my esophagus was damaged by radiation during my first line treatment). Sorry, forgot to add I’m so pleased at your longevity! Thanks, Janet, for the information. I’m always curious about medications other LC patients use to control side effects. I had radiation, so I’ve got some evolving fibrosis from that, which results in a chronic (and annoying) cough. I take nebulizing treatments as needed plus a cough medicine. 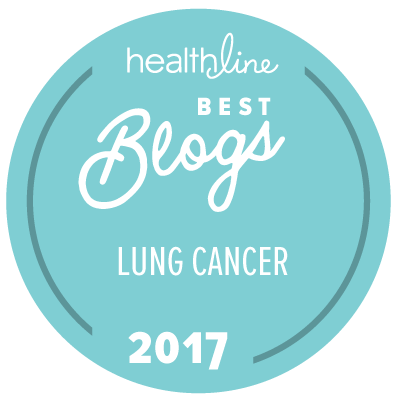 This post, and especially the last two sentences, exemplify the message I feel is most important for lung cancer patients (and caregivers, too). It’s a critical part of changing the narrative on this disease. Thank you! I was diagnosed a little over 12 months ago with stage 4 ALK positive lung cancer. As typical for ALK I was a non smoker and no other obvious causes like radon etc. I read your achievements and all I can say is WOW!! I feel I’m up to about stage 2-3 on your achievement scale. I hope I can achieve half as much as you have. Thanks, Colin! I hope you find meaning and satisfaction in advocacy.